Copyright © 2010-2016 by Royalty Industries LLC. All rights reserved. | Designed by Miller Design Studio. Does your child always check the mail looking for something for them? 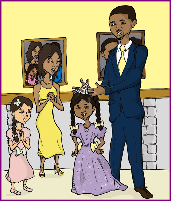 If so, register your lil' princess with The Adventures of Princess Zaria Fan Club. Click here for more information. Zaria learns that her name means Princess. Follow her as she discovers what her parents have known all along. Published by Second Time Media. Lifetime membership for girls ages 3-10 for only $15.99! Click here to sign up. Over two dozen fun and interesting tips of things you can do for and with your child to make them feel loved. Published by Second Time Media.